Radicalism is as American as apple pie. One can scarcely imagine what American society would look like without the abolitionists, feminists, socialists, union organizers, civil rights workers, gay and lesbian activists, and environmentalists who have fought stubbornly to breathe life into the promises of freedom and equality that lie at the heart of American democracy. 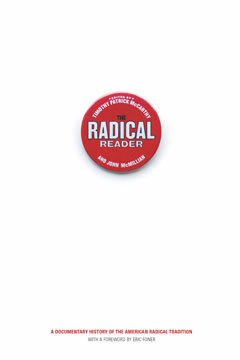 The first anthology of its kind, The Radical Reader brings together more than 200 primary documents in a comprehensive collection of the writings of America’s native radical tradition. Spanning the time from the colonial period to the twenty-first century, the documents have been drawn from a wealth of sources—speeches, manifestos, newspaper editorials, literature, pamphlets, and private letters. From Thomas Paine’s “Common Sense” to Kate Millett’s “Sexual Politics,” these are the documents that sparked, guided, and distilled the most influential movements in American history. Brief introductory essays by the editors provide a rich biographical and historical context for each selection included.